Tomorrow is Veterans Day and for the first time in many, many years I have the day off from work and I plan to spending it putting up my Christmas tree. I've always decorated early. I love Christmas so much that I want to be able to enjoy my decorations for as long as possible and that means putting them up in mid-November and not taking them down until mid-January. 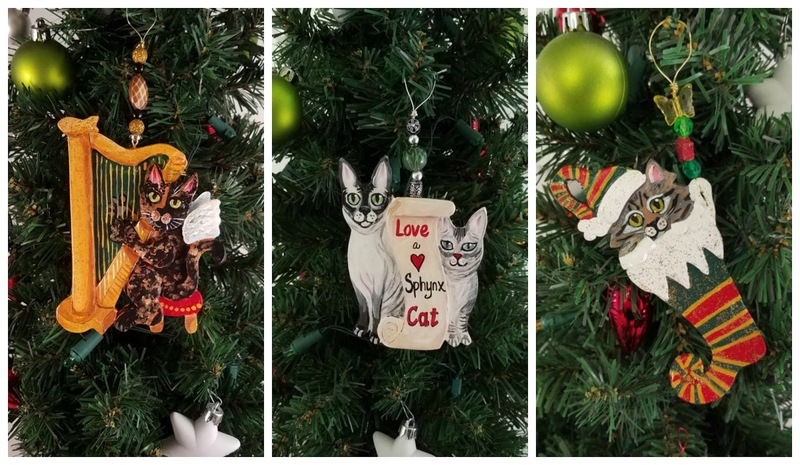 Not surprisingly, the majority of my decorations are cat-related (even down to the nativity scene), and my entire tree is decorated with cat ornaments. I have a large collection that dates back to my childhood and I still pick up cat ornaments whenever and wherever I can find them, everything from mass produced ornaments bought at department stores to handmade ornaments from craft fairs, and of course all my cats through the years have had their own personalized photo ornaments on the tree. It's getting harder and harder to find unique ornaments so my new favorite place to shop is Etsy. When I first saw the work of Laura Anglemoyer, the artist behind KittyCat Studio, I found myself entranced by her whimsical designs, and was particularly delighted to see that she has several tortie items in her product line (calico ornaments are fairly plentiful, but torties are nearly impossible to find)! Just about any kind of cat you're looking for is represented in her work, even rarer breeds such as Russian Blues, Sphynx and Bengals. Each of Laura's designs are created from her own artwork, and are handmade, hand painted, and one of a kind. In addition to ornaments she also sells adorable mini tree toppers, paper cat dolls, bowls, desk organizers and plaques. Plus just about everything in her shop can be purrsonalized with your cat's name and likeness! 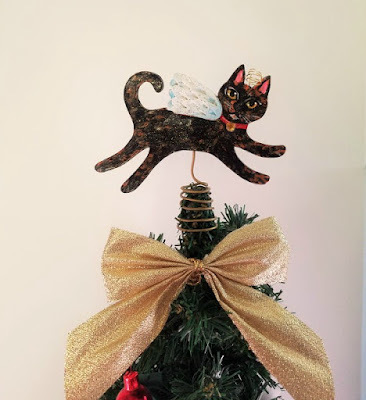 As luck would have it while I was in communication with Laura for today's post, my dear friend Ingrid at the Conscious Cat blog was running a giveaway for a tortie tree topper...and I WON!!! 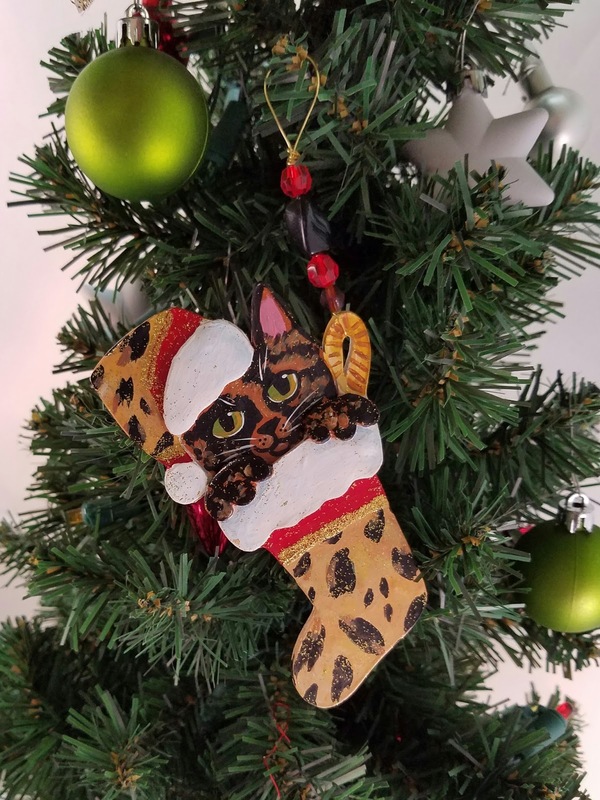 It will be the pièce de résistance to my cat-themed tree, and my little tortie treasures (the tree topper and cheetah print ornament) will remain a part of my home decor long after the holiday season is over. 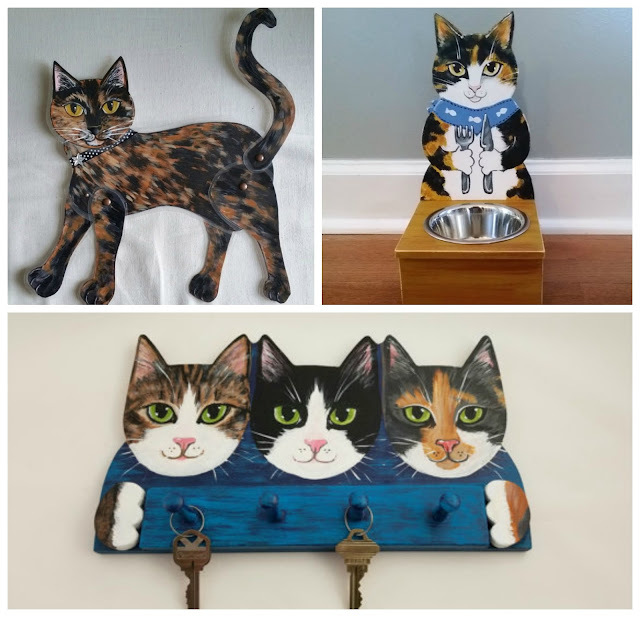 If you're looking for something extra special to add to your Christmas tree this year, or a gift that the favorite cat lover on your shopping list will treasure for a lifetime, look no further than the KittyCat Studio Etsy shop. KittyCat Studio has generously allowed us to offer a pawsome giveaway: One lucky winner in the US will win the ornament or mini tree topper of their choice (excluding customized pieces)! To enter simply fill out the Rafflecopter below and good luck! Disclosure: I am being compensated for featuring this content but we only share information we feel is relevant to our readers. Also, the links are affiliate links, which means if you click on one and buy something Mudpie gets a little money for her piggy bank! You always find the cutest knickknacks and holiday decor! I don't know yet if we'll have a tree this year - my human is really spotty about doing that - but I hope so! I'd pick the ginger cat ornament. Oh my goodness, you are killing me with these amazing items you always find and share with us. These are seriously too cute to handle! I would have to go with one of the calico pieces, for my angel Rosie. I am really drawn to a calico angel tree topper, because of my angel Rosie. That would be so very purrfect for my tree. Thank you so much for sharing this with us, Melissa and Mudpie! I will probably be visiting Laura's Etsy shop a ton now. Purrs, and have a wonderfully fun time putting up your Christmas tree! Will we see pictures of the final product? I bet it is just about the cutest kitty tree ever! Beautiful. I like the tabby cat tree topper. Thanks for the chance. Purr-ecious! I'd choose a tortie one, in memory of my two girls. OMC her things are fabulous! We would love the tabby tree topper! Mom used to have a lot of Christmas things that were passed down from her Nana and her Mom as well as tons of cat ornaments. She lost all of that in a fire and has slowly replaced things. Our big tree is 99% cat ornaments and then there is a smaller one in the family room called the "survivor" tree that has the few things she got out of the fire. Most have been burned in some way or melted (she put gold wire around them to hang them). She treasures them. Those are adorable ornaments! You're right, it's hard to find tortie items. The topper is just too cute!!! OMC! Love these! We would definitely need a Tortie ornament! Thank you and Mudpie for offering this giveaway! We're crossing our paws! Gee, if I win can I have one of everything? LOL! This is a difficult choice, but I think I'd have to pick the tree topper in the picture just above the giveaway form. The angel tortie kittie. I like the cat scroll ornament tortoiseshell and black cat. These are so adorable. I would love to win a tortie ornament for Penny. No trr here yet, but I am going to get the music started. Enjoy your day off. Wonderful and so creative. They are very special. I would love a tortie cat topper very much. Thanks. These are so creative and really are unique. I'm open to any ornament or tree topper. Thanks for the giveaway. Love love love your cat find this week! I hope we get to see your tree! I love that tortie ornament! Everything is so cute. OH my goodness such beautiful and adorable things to make decisions on! I would like a grey and white cat ornament or mini tree topper. All of them are so adorable and I would be happy to put any of them on my little tree. I love the white cat ornament its so cute. The tortie playing the harp is adorable. I love the cat playing the harp. I like the kitty and the harp. Remind me of my Purrpot, who recently passed. I love Laura's artwork. I'll have trouble picking just one thing. Thanks for the giveaway. A tortie on top of your tree... how appropriate! Those are adorable. Love these! I would pick the cat harp ornament! I'd choose the kitty with the harp ornament.